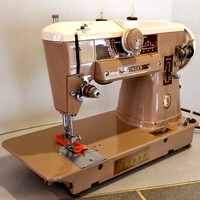 "Vintage Sewing Machine All Star List": I have chosen these models because they are still serviceable and respected machines. If you have a favorite, please email me and let me know what it is. I will be happy to discuss its merits and consider it for my "List". 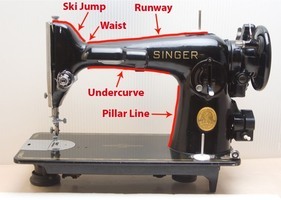 Machines have many bells and whistles but the most used function is the straight stitch. The second most important feature is reverse. Reverse enables you to back tack, tie off the seams so it won't unravel. Seems pretty trite in today's world of computerized everything. My intention is to discuss the machines that have survived and are still producing projects today. 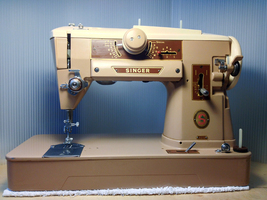 I've been working in the sewing machine industry for 40 years and have compiled numerous experiences with most makes and models produced. Needle standardization played a huge roll in manufacturing and distribution. During the vintage years, the 15x1 system prevailed. 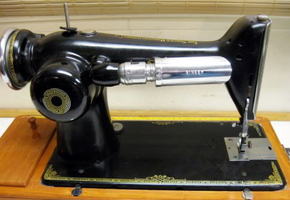 Thread and fabric handling mechanism reliability, durability and precision are the corner stones of classic machines. 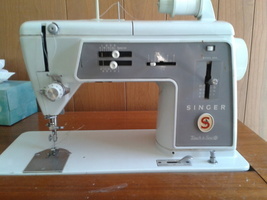 The Singer 101, the 201's predecessor, had no reverse but has the same sweet hook engineering, maybe even smoother. The 101 is very rare. I have sewn on only a hand full in my long career. Old Singer electric machines are not valuable except to those who can use them. They have no collector value. We hope that someone will use them when discovered. 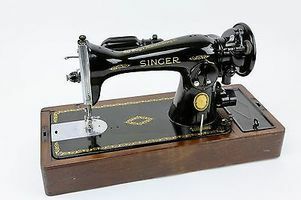 This is a Singer gear driven model with a 15 class bobbin case. The 15 class case loads underneath on the left. 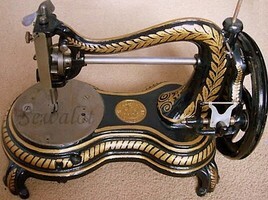 It uses the largest bobbin, 15 class, like many of its contemporaries. This is an oscillating hook system and doesn't enjoy the smooth characteristic of the 201 but it is extremely reliable and has celebrated straight stitch quality. 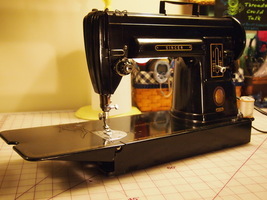 15/91's are plentiful and valued for their sewing performance. 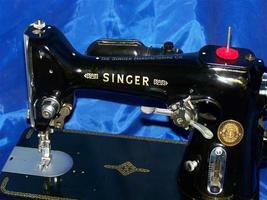 The Singer 201 is treasure for it's smooth performance and precision engineering. The world's first direct gear drive rotary hook with a top drop-in bobbin and reverse. This machine is smooth and precise. Oil in the motor has spoiled many of these old machines. The featherweight has a huge "fan base". It's cute design and it's enormous production makes it the most celebrated machine of all time. Quilters love them because they're lightweight and have a beautiful straight stitch. 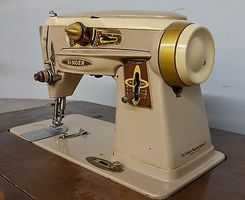 It's the Model "A" of the sewing industry. This machine has the original case, accessories with the box, instruction manual and even the original oil container. You couldn't find one better if it were new! 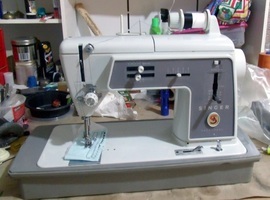 This Featherweight is a bargain for the collector and a treasure for a seamstress. The first zig zag. 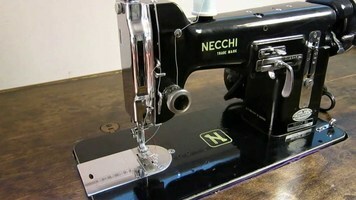 Necchi was an Italian brand and imported the first Zig Zag machines sold in the US after World War II. Singer was late to the party with it's 206 zig zag. 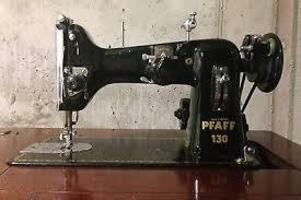 The 130 was Pfaff's first flirtation with the US market, an early zig zag after WWII. 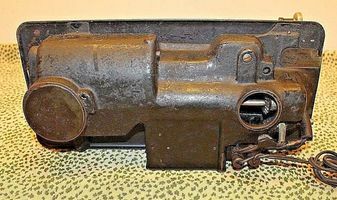 These machines are prized by merchant marine's as they're a zig zag portable and can be used effectively to mend sails. Singer's first zig zag using a Pfaff patent, I believe you can see some similarities. The 206 machine came in black, the 306 and 319w were beige and 2-tone green respectively. It uses a special needle system, making it less preferred as it's hard to come by. The 319W came along in two tone green using the same needle system. These were belt driven but had sturdy construction. 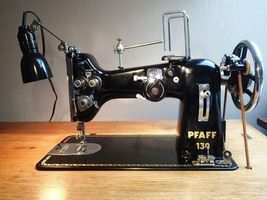 If it hadn't been for the 206 needle, this machine may have been cherished as the Pfaff 130. I'm including it primarily for historical significance, as Singer dominated the US market until the mid 70's. A precision all gear driven with a the new slant needle construction. This machine really brought it all together. These came in 3 different color combinations, black, tan, and two tone, all equally excellent. 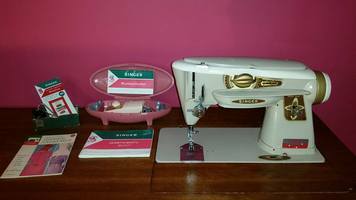 Very portable, these models are cherished by the quilter community. 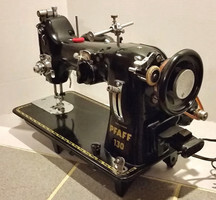 This is an early automatic with many built in stitches, interchangeable cams, slant needle, full rotary hook with a front drop-in bobbin. 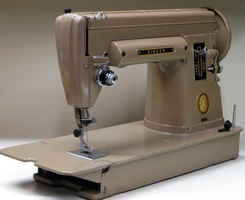 The 403 was the last of the straight stitch models. The 400 srs is considered by many aficionados to be the best Singer ever made. The machine pictured at the left is a mint example of an end of an era. The 500A was the last of the Singer all metal models. The 500A is very similar to the 401A with a new space age design reflecting the times of the early 60's. 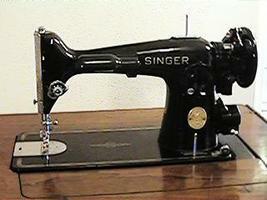 This Singers first self winding bobbin, the first "Touch n' Sew". This was the last of all metal gears. What a great running machine with a wonderful sales feature! 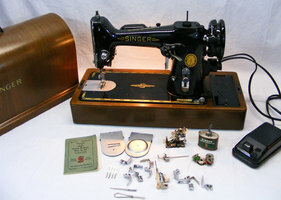 Singer is the only company to ever produce a machine with a bobbin winder feature that winds directly inside the bobbin case. Customers are still pursuing these models for that feature. The Singer 600e is the best available! 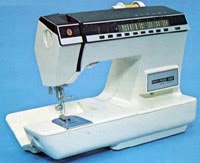 The Athena 2000 was introduced in 1975 and was the first electronic sewing machine. The Athena was introduced at $799 and the machines were flying off the shelf. The machine had a hiccup, the mother boards were failing. 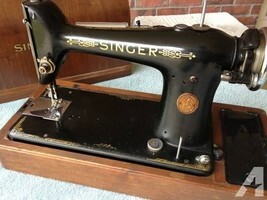 Singer replaced boards as fast as new machines were sold. None the less, what a fantastic machine and a pleasure to demonstrate! Swiss precision, and a prime reason for Singer's eroding market share is the early and mid seventies. The 62C has a smooth operating rotary hook with a unique cam operated thread escapement mechanism that allowed the thread to travel around the bobbin case without a "pinch". 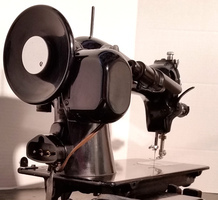 The "elnagraph" enabled the machine to produce stitches using forward and reverse feed motion with it's left to right needle placement. 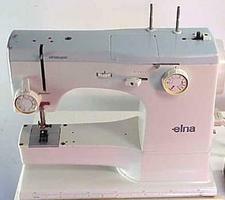 The Elna SU boasted "upgradable" because it used interchangeable cams. Other manufacturers tried frantically to produce this "stretch stitch" pattern but were late to the party with sub quality products. 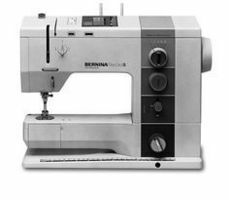 This precision machine has exceptional fabric handling characteristics and could sew the toughest material, like belt leather, effortlessly. Swiss precision strikes again during the same period as the Elna 62C. The 730 and 830 are both great machines but the buttonholer on the 830 was much simpler to operate. 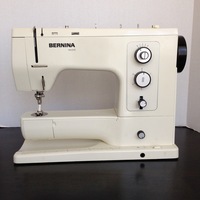 The Bernina 830 uses a CB hook system, similar to common oscillating hook systems. 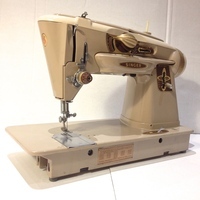 This hook system handles difficult threads, commonly used for free motion embroidery, making this brand a popular choice amongst embroidery enthusiast during the late 70's and 80's. 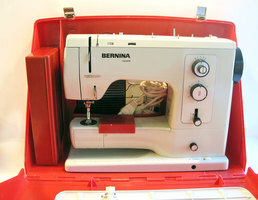 Bernina introduced the electronic foot control in the 830E. 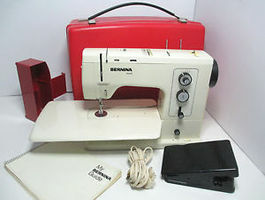 This was Bernina's first machine using forward and reverse motion feed to produce stitch variety and seam flexibility. This machine came with a brilliant basting stitch. This was a good overall machine with good staying power. 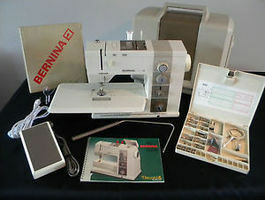 A seamstress could be happy sewing with any 900 series Bernina. 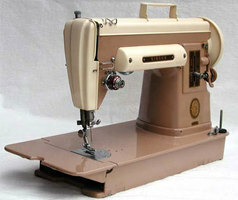 This model was considered the "best of breed" amongst many sewing machine aficionados. 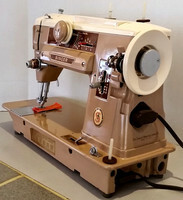 The Memory Craft 9000, like other Memory Crafts, is recognized through the sewing industry for ease of operation, precise stitching and embroidery. 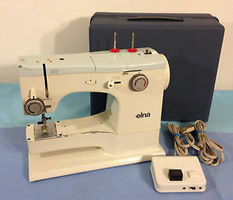 All sewing functions are easy to access via the extra-large Visual Touch Screen. 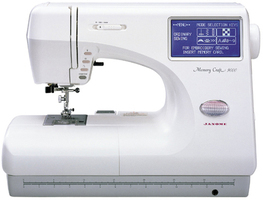 The Memory Craft 9000 remembers your stitch combinations so you don’t have to. Technically, this machine is dated, from 1994. Regardless, with machines replacing it selling today for $10,000, you'd consider this a great value. This particular machine was owned by a special person who took excellent care of it. She had accumulated many extra embroidery cards, books and accessories. These extra items would easily sell for $1000, even in today market. We are including all of her loving care and her investment in all of these sewing extras for an extraordinary price to the right customer. 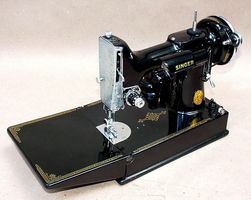 It is an excellent stand alone sewing machine, a machine that any seamstress would enjoy using. It has every built in stitch and buttonhole you can imagine. This machine uses technology that is still employed in today's new machines.